Marble is used throughout the U.S. Capitol Building, the congressional office buildings, and many other government and commercial buildings for its beauty, durability and relative ease of carving. It forms exterior surfaces and such interior elements as floors, walls, columns and stairways. Marble is also commonly used for statues and other sculpture, both indoors and out. The term marble is applied to many varieties of stone that have been used in architecture and sculpture since classical times. Marble is formed by metamorphosis, which occurs when rock containing the mineral calcite (most commonly limestone) near the Earth’s surface are drawn downward by geological processes and are recrystallized by heat, pressure, and chemical action. The color of the resulting marble is determined by the amount and type of impurities it contains: the purest white marble shows the fewest, while other varieties may be pink, gray, green, yellow or black. Veining or banding in different colors often occurs. Marble has long been prized around the world for its beauty and relative ease of shaping compared to such stones as granite. Because it was much less common than other types of stone and was difficult to transport in very large blocks, it was used primarily in decorative architectural elements, such as column capitals, and in sculpture. Its fine grain can hold small details better than most stones, and its slight surface translucency resembles that of human skin. It is also easy to polish, and as it ages it grows more durable. Unfortunately, marble remains porous and is easily damaged by human skin oils, which lead to yellow or brownish stains, and, if outdoors, by acid rain. The founders of the American nation drew architectural and aesthetic inspiration from ancient Greek and Roman civilizations, and the builders of the U.S. Capitol would readily have used marble if it were available. However, no nearby deposits had been discovered when construction began, so sandstone was used for the exterior cladding and for carved decorative features throughout. By 1816, however, marble was being quarried along the upper Potomac River and imported from Italy, and over the succeeding decades further discoveries and improvements in transportation allowed its far more extensive use throughout the building. Nearly a dozen states have provided marble to help build the Capitol Building; it is used in floors, baseboards, stairs, railings, door frames, wall panels, mantels, columns and cornices. Marble from Massachusetts forms the exteriors of the mid-19th century House and Senate extensions, and Georgia marble clads the East Front connecting corridors. Italian marble is used in the grand staircases and the Senate chamber. Many of the statues in the U.S. Capitol are also carved from the fine, white marble quarried near Carrara, Italy, which has been favored by sculptors for centuries. 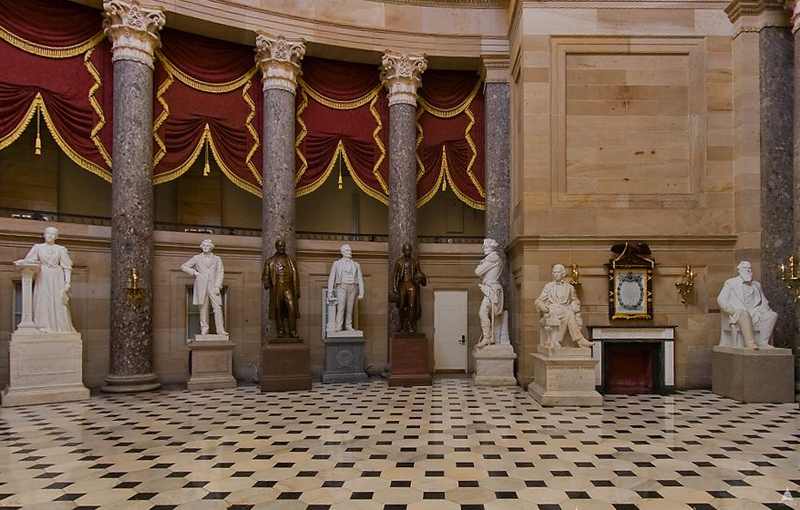 Elsewhere within Capitol Hill, all of the principal congressional office buildings are faced with marble, as are the Library of Congress John Adams and James Madison Memorial Buildings, and marble floors, stairways, walls, columns and sculpture enrich many interior spaces.